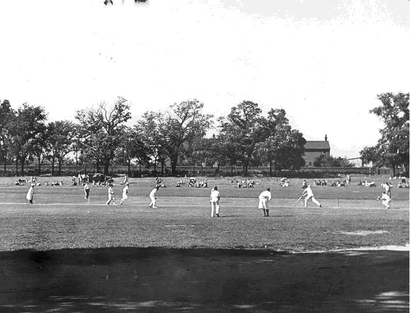 In 1954, the first game of cricket was played on the Anglo American Playing Fields, the home of Saffron Walden Cricket Club and known then, affectionately, as the Meadow. 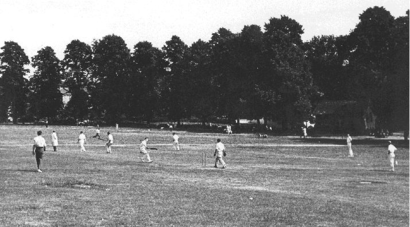 There were those who resisted the move from the Common – arguments abounded about the long history of the cricket on the Common with the earliest records dating back to 1757. Others talked of accessibility and the numbers of spectators. In the end, the cricketing arguments won the day. Despite the loving care and attention of groundsmen like Will “Bill” Stubbings (1930-1946), the quality of the outfield, rather than the wicket itself, was the real issue. Jeff Goodwin recalls the Town Hall meeting when the decision was made. “The voices of opposition were not very loud” according to Jeff. The Playing Fields are now regarded as one of the finest cricketing venues in East Anglia and it all came about because of the desire of the American forces to create the first memorial of its kind in Saffron Walden. Nevertheless, the Common retains an almost iconic status in the history of Saffron Walden cricket. The Pavilion, which was carefully taken down and rebuilt at the Playing Fields, was situated close to where the children’s playground is now sited. Local resident, Don Purkiss, recalls running and cycling round and round the Pavilion as a child. Don did not play cricket but clearly this location was always meant to be a children’s playground! Of course, this was a time when there was no car park and the Convent dominated the skyline on the Ashdon Road. However, it was still used as a thoroughfare by locals who would exercise their time-honoured right to walk across the Common whether or not there was a match taking place. There are many stories including the one of the local gentleman who would sit in the outfield and not move unless paid or offered tea. There are records of tents being erected for ladies as well as officials. Barry Skingley, a former player, remembers tea being taken at Ralph Moore’s Corner Café where China China now is – changing times indeed! During the First World War the Pavilion was used as a canteen. There are records that suggest there was more than one pitch on the Common and that it may have been used by the Saffron Walden Victoria Club or the Grammar School. Certainly the Common was shared with Sewards End CC for a time after the Second World War. The Early Closing Club provided another opportunity for cricket but in 1902 it merged with the Town club who, from then on, fielded a Thursday XI until at least 1942. But there was no cricket on a Sunday on the Common – the Town played all their Sunday games away from home! The first recorded game on the Common was reported in the Cambridge Journal - On Mon. June 26 1758, at Saffron Walden, Cambridge beat Saffron Walden. Cambridge also won the return match on Wednesday, July 5, on Jesus Green near Cambridge.” The Cambridge Chronicle reported that on Friday 9 August 1816 at Walden Common, SWCC scored 117 and 48 against Cambridge who made 88 and 80-9. Cambridge won by one wicket “ as usual”. The report also stated that “… the outskirts of the spacious Common were promenaded by a greater assemblage of Ladies from the town of Walden and parts adjacent, than ever before remembered on such an occasion”. Certainly, one attraction of cricket on the Common was its ability to attract large numbers of spectators. On 9 September in the same year, Bishops Stortford played Cambridge on the Common, the latter winning by 100 runs. It was clearly a major event with references in the newspaper report to “… both clubs stand high on the list as good players. The coach which conveyed the Cambridge Cricketers to Walden … was met by an excellent band of music …provided by the gentlemen of the Walden Club…”. It went on “…it raining almost the whole day, after the game, the Walden Cricketers furnished the Cambridge men with fresh dry clothes, and indeed the members of Cambridge Cricket Club cannot omit this opportunity of expressing the high satisfaction felt … on the present, as well as on every occasion in which they have come in contact with the Walden gentlemen, at their very polite behaviour and manly deportment” . No doubt the same is said these days about Giles Ecclestone, Jamie Sparrow and Neil Gladwin! Looking from the Pavilion towards the Ashdon Road and the Convent c.1950. Note the large number of spectators. In C.B. Rowntree’s book “Saffron Walden Then and Now” (1954 – an annex on cricket) it was reported that for a match versus Stortford “a good number of people assembled to witness the match between the two towns – if the Bishop’s Stortford club can be said to belong to that town; Walden always prides itself on presenting eleven townsmen”.